Ospedale "SS. Capitanio e Gerosa"
List of Countries » Italy » Bergamo and its Province » Ospedale "SS. Capitanio e Gerosa"
The Ospedale "SS. Capitanio e Gerosa" (Hospital of the Saints Capitanio and Gerosa) is a hospital located in Lovere (via Martinoli, 9). It was opened in 1930, after the closure of the "Ospedale per Infermi Cronici e Miserabili" in 1923. 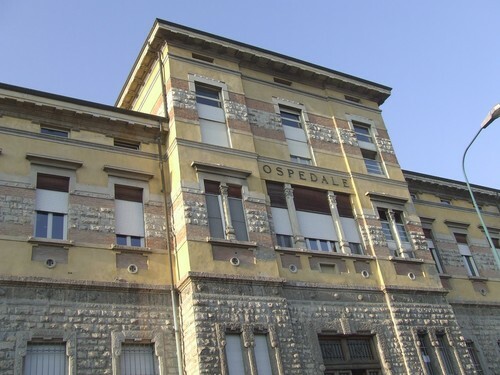 The hospital is entitled to the two nuns founders of old structure1, Vincenza Gerosa and Bartolomea Capitanio, recognised as saints by the Catholic Church in 1950. In the second half of the XIX century the town of Lovere and near villages experienced a noticeable demographical expansion due to the opening of several industries, factories and the modernisation of public services. 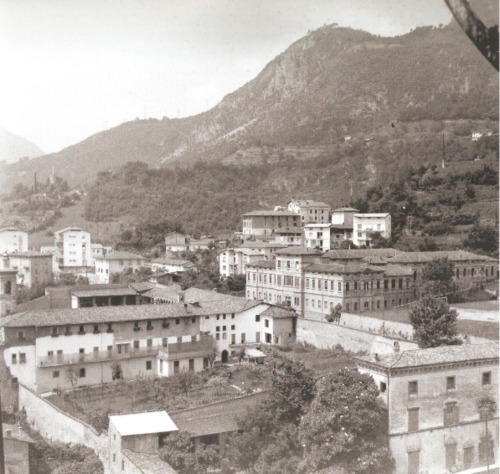 As a matter of facts Lovere took advantage of its geographical position: there were built two railways that connect Bergamo and Brescia to the Valcamonica, making of Lovere an important commercial crossroads. In 1904, to face de needs of the population in terms of health and hygiene, the Municipality of Milan made available a found “in favor of the Hospitals of the region Lombardia”, and 20,000 Lire were assigned to the Congregation of Charity that held the administration of the “Ospedale per Infermi Cronici e Miserabili” since the 1872. For this task it was established the “Committee for the New Hospital” composed by the Major, Sir F. Bonotti, Msgr. Don Marioni, Dr. C. Ottoboni, the surveyor F. Macario and the secretary M. Lavezzi. 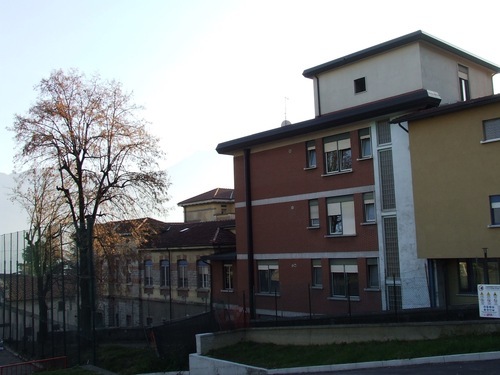 The president of the Congregation of Charity, Alfonso Bazzini, donated the field (called “Il prete” – “the preach”) where it was chosen to build the new hospital. This plot of land was situated on a higher altitude than the previous hospital, back onto the mountain so to result particularly appropriate for patients thanks to the pure and fresh air; besides it allowed a pleasant view on the Lake Iseo. Work started in 1906 with the construction company directed by Pellini on the project of the architect Tombola from Brescia. 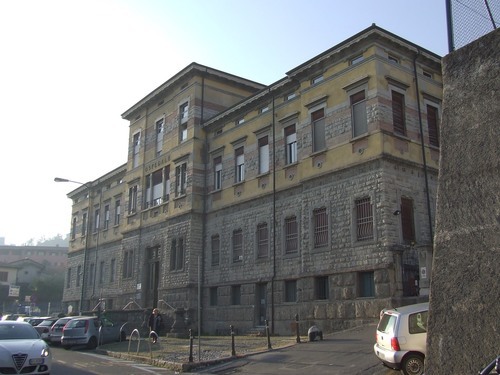 Although the Committee for the new hospital obtained a mortgage of 70,000 lire from the Municipality of Milan and other founds from the sale of old proprieties (buildings), the financial means resulted inferior to the estimated quote. Besides this, the project was not evaluated enough compliant with modern standards and as a consequence work had to be suspended after the only erection of one wing of the building. (The First World War in the period soon after the suspension of the work was also a noticeable obstacle to the accomplishment of the hospital). 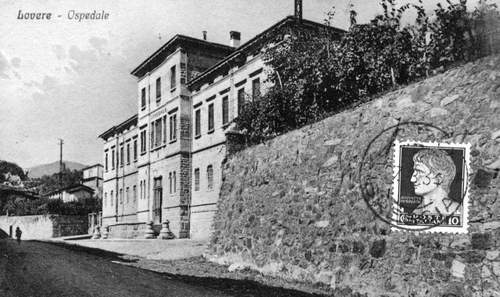 In 1923 the prefect of Bergamo demands the definitive closure of the “Ospedale per Infermi Cronici e Miserabili” next to Porta Seriana, the hospital founded by Vincenza Gerosa and led by Bartolomea Capitanio that for around one century operated in Lovere as the main nosocomial structure3. Therefore, the accomplishment of the new hospital became an urgent problem for the town of Lovere. It must be mentioned the personal dedication of Sir Filippo Martinoli (1864-1931), who issued and promoted a spontaneous collection in order to reach the necessary founds. 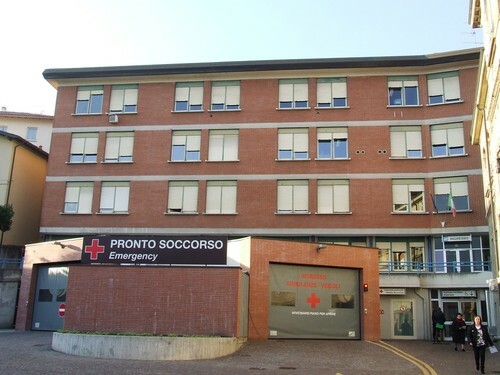 After the sale of the property of the "Misericordia”,4 Martinoli obtained the financial intervention of the Home Office, but it is also reported the economical contribution of 85 shareholders of the “Cooperative for the construction of social housing” that donated 1,400 stocks and the spontaneous help of public associations, private companies and families from Lovere, even with moderate donations. 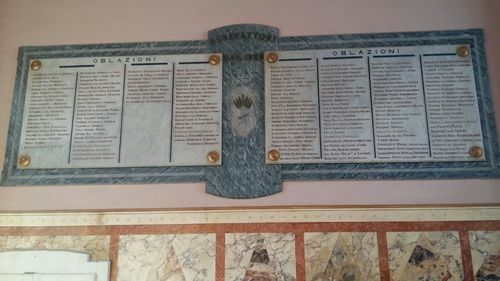 The Donations are commemorated on the gravestones next the old entrance hall and the avenue in front of the hospital is currently entitled to F. Martinoli. The fundraising brought to the conspicuous sum of 927,045.56 lire. Works suspended in 1906 could then be resumed and in 1930 the structure was completed accordingly to the improved and modernized project re-edited in 1924 by the engineer Rino Rillosi. 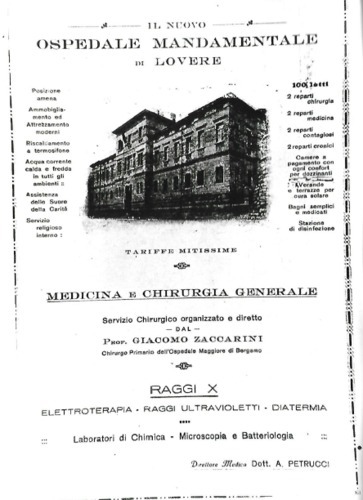 The 31st December 1930 was officially inaugurated the new hospital, entitled to the two founders5 Vincenza Gerosa and Bartolomea Capitanio blessed respectively in 1933 and in 1926. The two nuns were recognised as Saints in 1950 and the hospital acquired the current name "SS. Capitanio e Gerosa”. At its inauguration the hospital was provided with ten departments. The fee for health assistance was of 11 lire, 8.80 lire for those who were registered as poor. In 1937 the ECA (Municipal Public Assistance Board) was substituted to the Congregation of Charity and afterwards, the Hospital “SS. Capitanio e Gerosa” was classified as hospital of third grade. In 1955 it is reported the opening of the section “A.V.I.S” (Voluntary Italian blood donors’ association). In 1960 it was proposed to enlarge the hospital with modern facilities. The first work started in ’65 with the addition of new wings compliant with the ministerial directives for new wards and accordingly to the necessities of population. In facts, the hospital was provided with General Medicine and Surgery, Orthopedic, Obstetrics, Paediatrics, and a laboratory for chemical analysis. In 1970 the Hospital “SS. 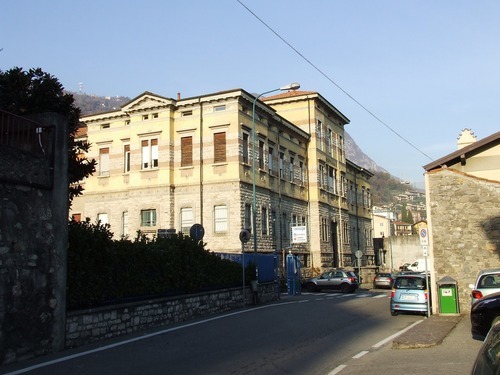 Capitanio e Gerosa” was formalized as “Health Trust” and afterwards, as a consequence of the law the instituted the National Sanitary Service (1978), it became USSL n°31 (Local Social-Sanitary Unity) together with the Hospital of Sarnico. The hospital “SS. Capitanio e Gerosa” remained the pivotal nosocomial structure until the 80s, when it encountered a gradual decline due to the opening of new and more efficient hospitals in the surrounding towns. The hospital gained new importance after the establishment of the Nursery School in 1991 and particularly for the realization of the new First Aid in 2012. "A view of the hospital from the bell tower" and "The hospital in the '50s" black-and-white photos were taken from "Immagini di Cronaca Loverese, fotografie inedite dal 1947 al 1972" by Elio Ballerini, Demetrio Oberti Publisher, Lovere (Bergamo). 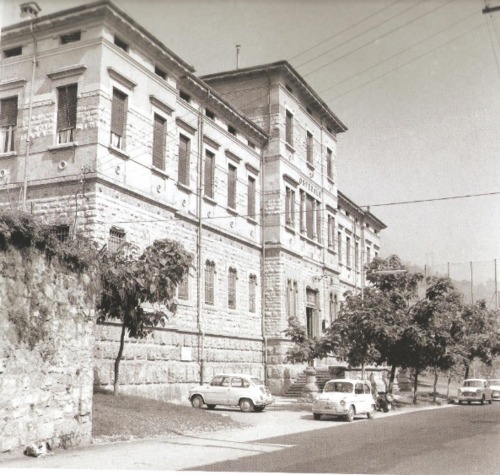 "The hospital in '30s with the façade built in 1906" black-and-white photo was provided by Virginio Pegurri. "'30s leaflet of the hospital" black-and-white photo was taken from "Ospedale SS. 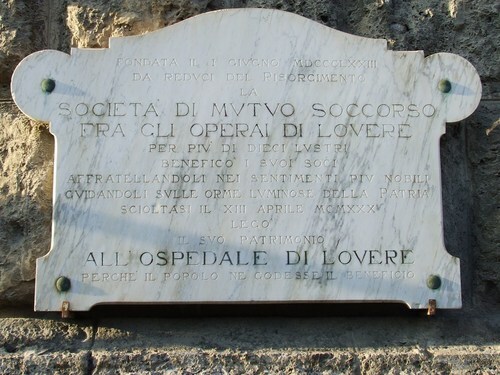 Capitanio e Gerosa di Lovere, fra storia e attualità"
Anonymous "L'ospedale di Lovere", pro manuscripto, Lovere? Anonymous "L'ospedale di Lovere", pro manuscripto, Lovere?, 1963? Anonymous No Title, pro manuscripto, Lovere? Anonymous "Ospedale SS. Capitanio e Gerosa di Lovere, fra storia e attualità", Lovere? 1. 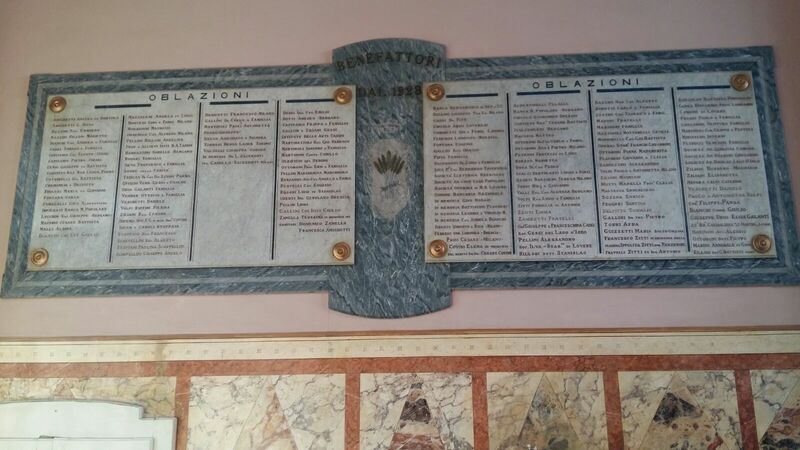 However, today the new hospital and the Ospedale per Infermi Cronici e Miserabili are considered as being the same institution that, for almost one and a half century, was led by the same charitable spirit of the two founders.